how could you have thought that no one would find out you had fathered a child with your mistress? The baby looks exactly like you! In a day and age where Maury Povich and TMZ exist it still amazes me how folks in the public eye can still think they can get away with things. 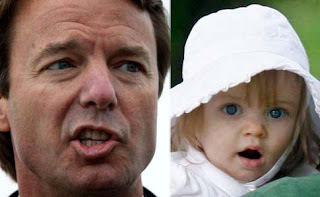 Brad Pitt can't even get coffee without it being documented on TV, but John Edwards thought that he would not get caught having a baby with a woman who was not his wife? I guess it is good for his conscience that he is finally admitting that he did in fact father baby Quinn with his mistress. The timing is a little more than strange, though. Edwards former aide Andrew Young, the man whom Edwards tried to con into saying that he was the actually the father of the baby, is releasing a tell all book on Feb. 2. The book release may be a little more than coincidental to Edwards sudden burst of morality. So sad for his wife that she not only has to battle cancer, but is also married to a jackhole! He is also certain to have damaged the lives of all of his children. Too bad politicians like George Washington no longer exist. For most of the people who run for election now can certainly tell their fair share of lies! I know, the whole Edwards debacle is so depressing! What a snake.